A fish without water can’t breathe, and we can’t live without water either! 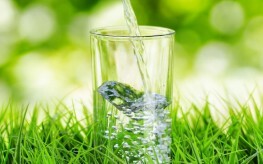 Staying hydrated is one of the most important ways to stay healthy and maintain a proper body weight, but most of us are dehydrated without realizing it. Without sufficient water in your body, your cells get congested, your skin can’t detox, and your bladder and kidneys won’t work properly. You’ll feel tired and eat more, too. Staying hydrated is one of the most important things you can do to stay healthy. You should also never consider sweet juices, soda, tea, or coffee as substitutes for pure water. They simply won’t hydrate you as well. Both sugar and salt as well as caffeine dehydrate the body. If you can’t kick the morning coffee habit, be sure to drink a tall glass of water along side of it to make sure you aren’t dehydrating yourself further as the sun is just coming up. Drinking more water is one of the safest, healthiest ways to detox the body. What’s more, when you drink more often, you will feel satiated, leading to weight loss from over-eating less often. Often when you feel hungry, this signal from the body is actually telling you that you need to drink more, so try a glass of water first, and then eat something if you are still feeling hunger pangs. 1. Combat Fatigue – You can’t run on all four cylinders if you are dehydrated. Water is one of the most important sources of energy for your body. It helps cells complete important enzymatic activities which contribute to good sleep, restoration of bodily systems, and the production of ample energy to get you through your day. 2. Reduce High Blood Pressure – When the body is fully hydrated, the blood is approximately 92% water. This helps to keep the blood moving freely through the veins and arteries, helping to prevent high blood pressure along with other cardiovascular ailments. 3. Halt Allergies and Asthma – When the body is dehydrated, it creates more histamines – organic nitrous compounds which help to regulate our immune response. If we have too many histamines circulating, we will feel congested and have difficulty breathing, along with other allergic reactions caused by the body’s response to foreign bodies. 4. Reduce Acne, Dermatitis, Psoriasis, and Premature Aging of the Skin – With proper hydration, the skin practically glows. Without it, our skin cannot properly rid itself of toxins and so it becomes irritated, inflamed, and congested, causing a host of unsavory results ranging from itching, blackheads, redness, acne, and general blotchiness. 5. Stop High Cholesterol – When the body hasn’t had enough water, it will start to produce more cholesterol so that cells can still function properly. 6. Eliminate Digestive Disorders – Water can help eliminate and reduce the incidence of ulcers, bloating, gas, gastritis, acid reflux, and IBS. You also will experience less frequent constipation since water helps matter move more quickly through the intestinal tract. A well-hydrated body simply purges toxins and metabolic wastes better. 7. Flush Out Unwanted Bacteria from the Bladder and Kidneys – People who are well hydrated experience less frequent bladder or kidney infections since water helps to flush out any unwanted microbes that try to accumulate in these eliminative organs. These organs are especially sensitive to disease without proper hydration since they are responsible for eliminating stored toxins and bodily waste. 8. Speed Up Joint and Cartilage Repair – Most of the padding in our cartilage is made up of water, so if we don’t drink enough of it, our bones will feel stiff and our joints will take a beating. Joint repair after workouts or injuries is also expedited by proper hydration. 9. Stop Gaining Unwanted Weight – When our cells are depleted of water, they cannot create energy we need to function, and so they send a signal to the brain to ‘get more goods.’ This means you will eat more, and likely carry some extra unwanted pounds. To avoid this, simply stay hydrated and your cells will stay happy and not send ‘fat signals’ to the brain. Further, and more obviously, replacing other drinks with water will help naturally keep the weight off. Some water with lemon each morning can be especially beneficial. 10. Slow the Aging Process – Finally, all of our organs require copious amounts of water to function properly. If we stay dehydrated for long stretches, every cell, organ, and system in the body has to work harder, which means we will age faster. Drinking enough water literally keeps you young feeling, looking, and acting – for longer. Try drinking water with a little lemon and sea salt after a workout instead of sports drinks that are full of refined sugar. Instead of drinking soda, replace this beverage with water. Try adding some lemon, orange or cucumber wedges or even letting a pitcher of water infused with herbs like mint, holy basil, or sage steep in the refrigerator overnight. The result is delicious and healthy. Another tip: Bottled water is deceiving. It is less regulated than tap water and costs 2,000x more. If you’re on the go, grab a bottle, but otherwise, opt for purified, filtered water. In colder weather, follow the Dalai Lama’s habit of drinking warm or hot water in a mug. The body has to work less hard to warm up water that is already heated to use it for the numerous tasks that require this essential liquid. I think that dehydration, and water drinking recommendation is not totally correct for everyone. I drink ZERO amount of water. No H2O ever. Yet, I am healthy, look way younger than anyone my age. I get water through vegetables, coffee, wine, beer, and fruit. So, all that hype about water is lies, or I am a superhuman? While a lot of people today probably would benefit from drinking more water and/or replacing garbage (soda, etc.) with water, I do think that it is foolish for people to listen to the advice of others instead of their own bodies. If you’re thirsty….have a drink- and let it be water. If you’re not thirsty, you probably don’t need it…so don’t take a drink just because you read something that is supposed to apply to “everyone”, as though we were all identical or operating under the same conditions. Listen to your body! [ Smiles ] Water is essential for life. I hope that they placed water as their main beverage instead of those sugary sodas. [ Smiles ] Splendid news!